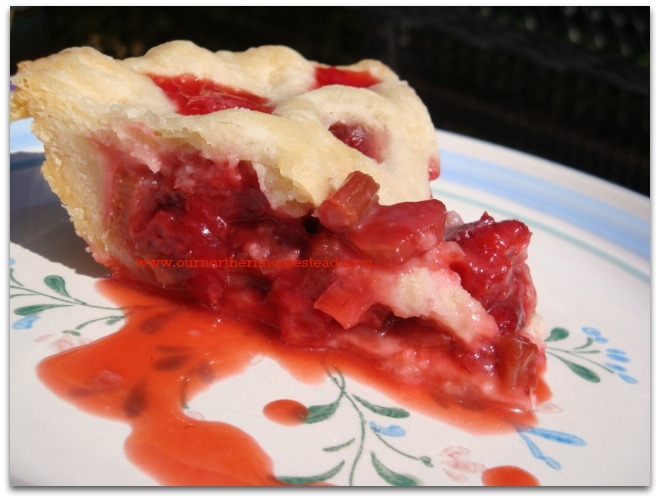 There are a few things in this world that really make me thank Mother Nature for….Rhubarb is one of those things. A truly wonderful gift to the culinary world. Seeing those first few crimson red stalks poking up through the earth after a long, cold winter make me jump for joy while reaching for the pie dish at the same time, which makes me wonder….is it a vegetable? Or is it a fruit? After a few minutes of googling, I found out it is neither. 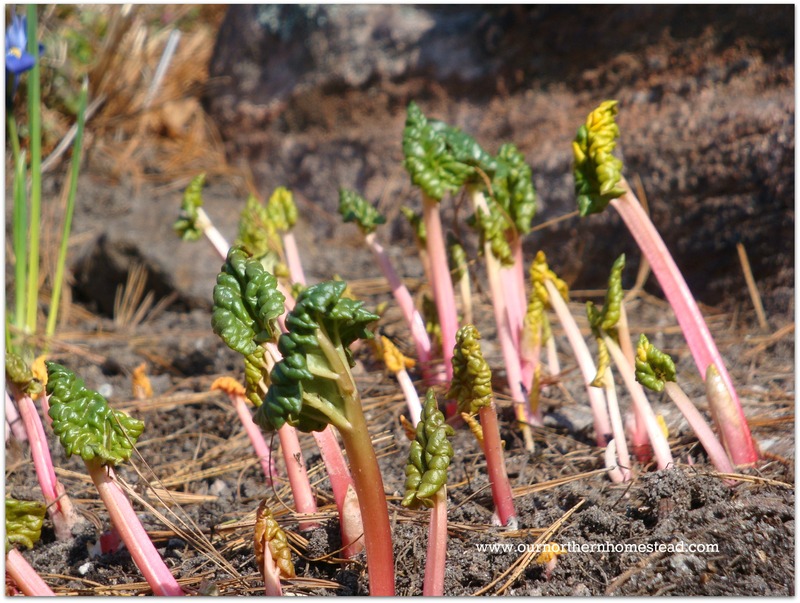 The tart and tasty rhubarb is an herbaceous perennial plant that thrives in the Northern and Southern Hemisphere’s across the globe and along with Asparagus, is one of the first harbingers of Spring. 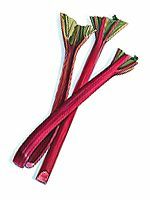 The stalks of the rhubarb plant are mostly used for desserts, but recently, there has been an increased focus in savory applications as well as pickling or drying. I remember being a child and heading out to our patch in the backyard and breaking off a large stalk, running into the kitchen to wash it off and then grabbing a small dixie cup of sugar …dip, bite, dip, bite, dip, bite….until it was gone. My brothers and I thought this was a great treat, better than cookies even. Today I mainly use rhubarb in pies and jam, and rhubarb has a perfect partner with the strawberry. A delectable union of sweet and tartness. The pairing of the two into a pie or crumble is the quintessential summer picnic dessert. As I patiently await the stalks to grow bigger, I will have my strawberry/rhubarb recipe at the ready, waiting to enjoy a taste of summer…and I hope you do too! In a large bowl, combine all ingredients except the butter; mix well. Place filling in a prepared pie crust shell, dot with the butter and top with the upper crust, crimp and seal edges. Bake in a preheated 425°F oven for 15 minutes, reduce heat to 350°F and bake for another 30 to 40 minutes. If edges of crust is browning too quickly, cover with foil. It’s Spring…or so the calendar says. I was late getting the garden prepped this year because apparently Old Man Winter didn’t get the memo that his season had ended. I swear I saw him being dragged by Mother Nature kicking and screaming down the street just last week, hurling snowballs in fits of anger like a petulant child. But now that Spring seems to have arrived, it is time to get the garden churned up and open for business. I know it is still way too early to set my lovingly reared little toms and peppers outside that have been basking in the sunshine in my living room window, but there are other vegetables that simply adore the cool Spring weather and those need to be planted NOW, don’t wait another day or before you know it, Summer will be over. 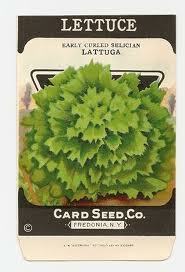 Lettuce: Pretty much any kind of lettuce, Bibb, Butter, Leaf, Romaine, Mesclun, all love to germinate and grow in the cool, damp soil that Spring provides. They actually grow amazingly fast in the cooler weather so be mindful of how many seeds you plant, lest you require a herd of bunnies to help you mow them down. 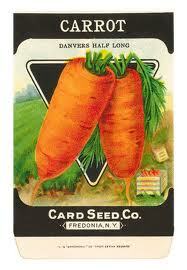 Carrots: Yup, Carrots are another cool weather loving crop to start now. Just remember to mix the seed with a little sand and spread thinly in a row. Best to follow directions on the back of the seed packet, why would they print all that info if no one followed it? 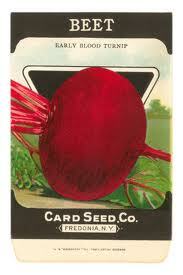 Beets: Red beets, golden beets, whatever kind of beets you like, now is the time to sow them so that come early summer, you have a nice, tender batch of young beets, perfect for pickling or for summer salads. Radishes: Another great cool weather crop to sow. I have 2 kinds of radishes planted, and the best thing about them? 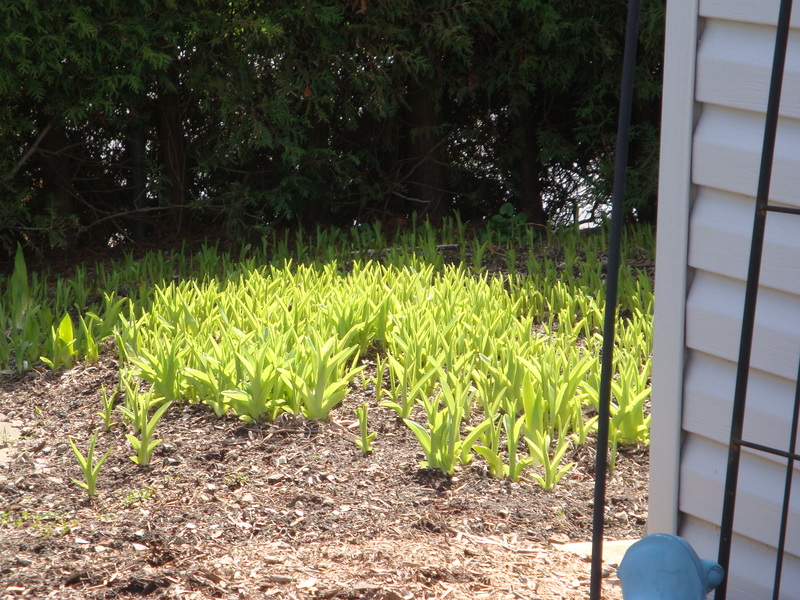 They are ready in less than 30 days from the time they germinate – amazing! You can also use the greens in salads too, as well as beet greens. I love veggies that do double duty. 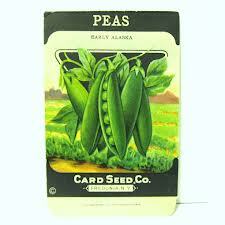 Peas: Who doesn’t love the fresh, crisp pods of bright green peas? Peas simply adore the cool Spring weather and will tolerate even a light frost. Sow seeds in successive crops every 2 weeks as long as it is cool, if you are lucky in where you live that you have a longer growing season, you can grow a final crop planted in mid-August for fall harvest. My kids used to love going to Grandma’s to sleep over and helping to shell the ‘Poppin Peas’ for dinner. So named because when they tried to open the pods, the peas would ‘pop out’ all over…not sure if Grandma really liked finding stray peas under the stove and fridge. One final note, be sure to keep the soil moist while the seeds are germinating and soon you will be harvesting your very first batch of lettuce for the many tasty, Spring salads to come. As we approach May, I for one am thankful that January…. um.. I mean…April will finally be O-V-E-R. 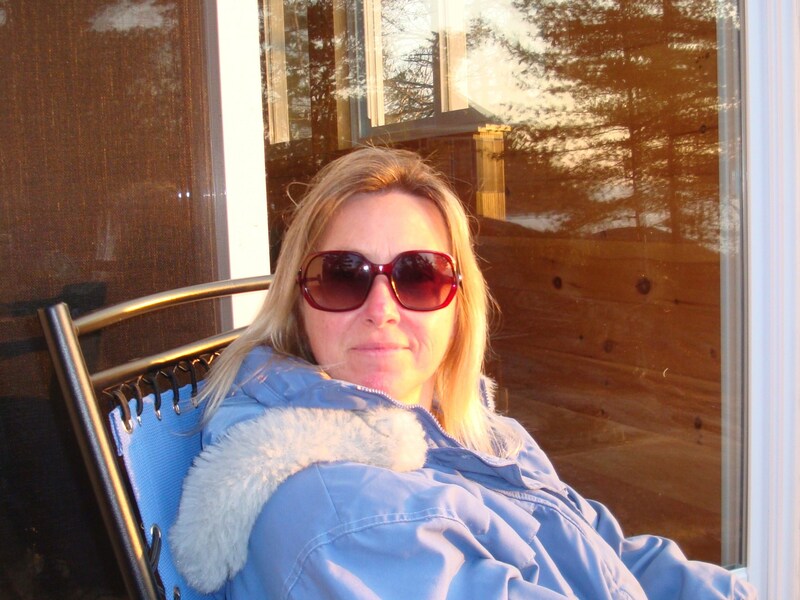 I have had my fill of snow, sleet, monsoon rains and high winds….with only a few precious days in between of warmth and sunshine. Here’s to hoping May finally sees us getting the steady, normal Spring weather patterns we should be having by now as I am itching to get more gardening done. 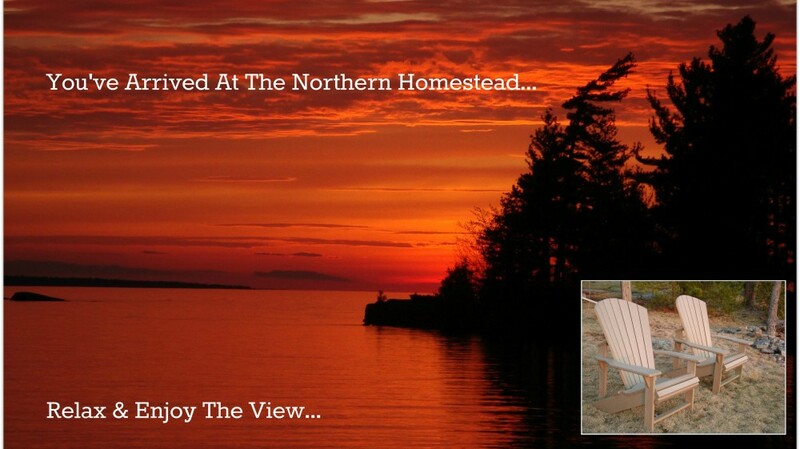 Meanwhile, many projects abound at the Northern Homestead and the City Homestead as well in the coming days/weeks. The bizarre storm of last week has hubby gearing up to fix the dock that was tossed aside like Jenga blocks and the cedar hedge at the City Homestead is in desperate need of its annual haircut – that alone is a 2 to 3 day job (fyi ~ cedar hedges are great for privacy, but boy do they come with a lot of labour to maintain). 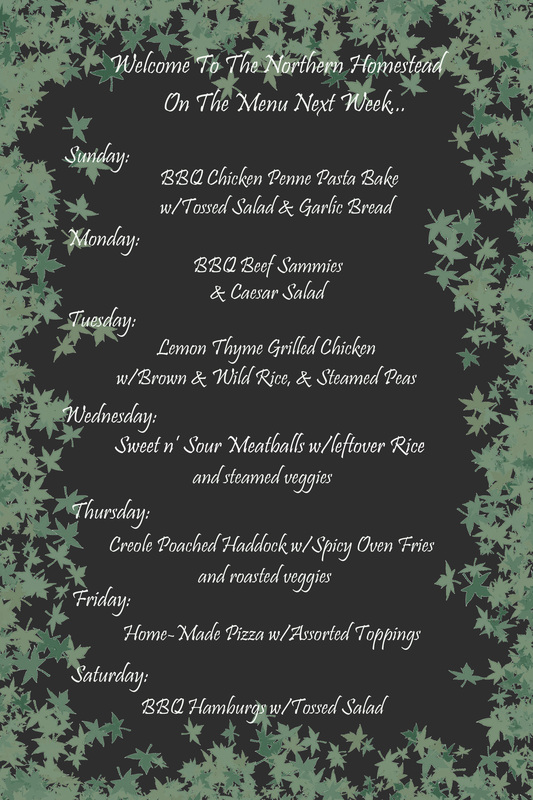 Meanwhile, here is next week’s meal ideas, sometimes things are set in stone, other times…not so much…hope you are inspired though! 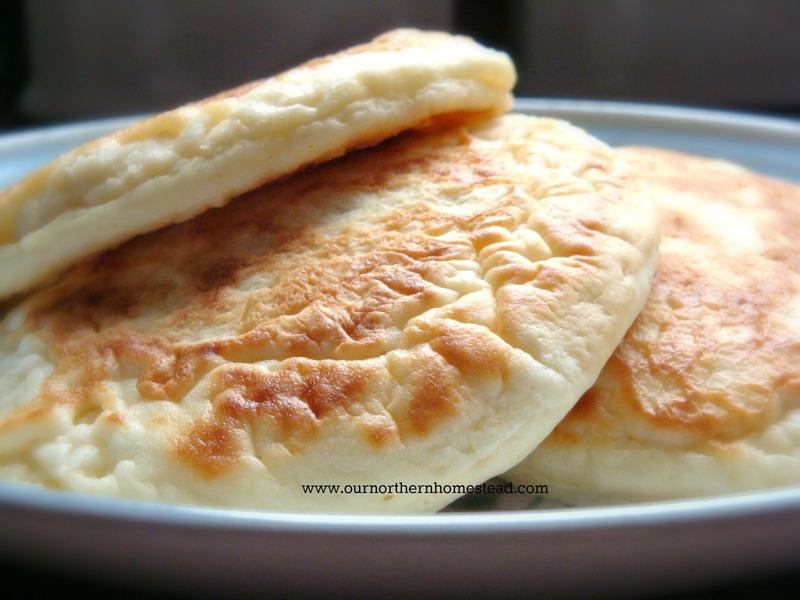 This is a follow up to last week’s Cookbook Fetish post, whereupon I had a few requests for the pancake/griddle cake recipe…so instead of hoarding it, I decided to share it. I know, highly amiable of me isn’t it? As mentioned, this recipe is pretty simple, but it is also simply outstanding. You will have no need to go back to a prepackaged pancake mix ever again. With a short ingredient list that you already have in your pantry ~ guaranteed (if you don’t, you must be in college) you will wow your family this Sunday morning with hot, fresh Mlyntsi. 3/4 Cup Milk * Feel free to use fresh buttermilk if you have it, not a necessity though. Sift dry ingredients. Add remaining ingredients and beat with a hand mixer or blender until thoroughly blended, let sit for 5 to 10 minutes for the baking powder to activate. Grease a large griddle or frying pan lightly with Canola or Olive Oil; heat over med-high heat until a drop of water sizzles on the surface. Pour batter in 3″ diameter circles and cook until the surface is very bubbly, flip to the other side and bake until golden on the underside. Do not flip more than once and never, ever squish them! Serve hot with maple syrup, honey, jam or sour cream. The above poem pretty much sums up me and my garden. I love Spring, time for plants to awaken and the cycle begins all over again. Today was the perfect day to get the garden bed ready, it had finally dried out enough from the monsoon rains of last week and with more forecast for the next couple days, I thought I had better get out there and get things ready to go. 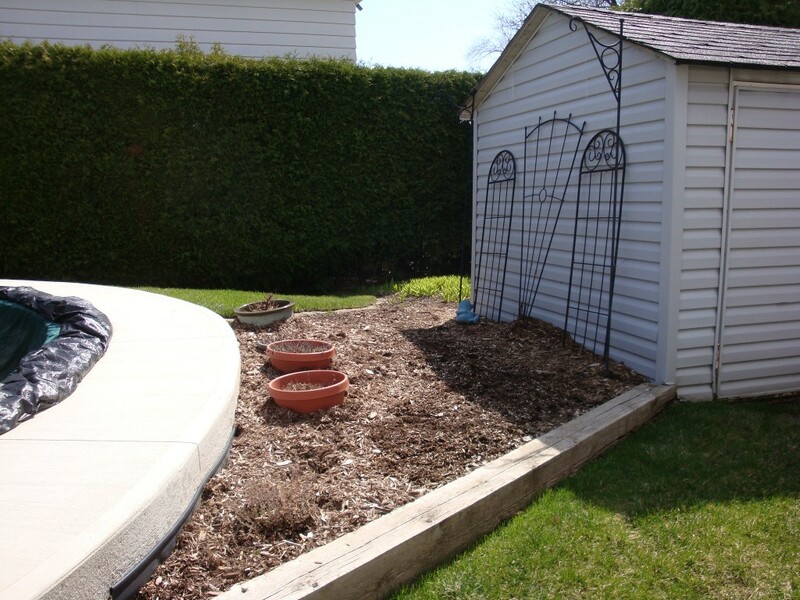 Below is the before shot, after burying my herb pots last fall and covering the bed up with a layer of mulch, things are looking pretty drab. I dug out the herbs, washed the outside of the pots and set them aside until I finished raking all the mulch to one side and turning over the soil. 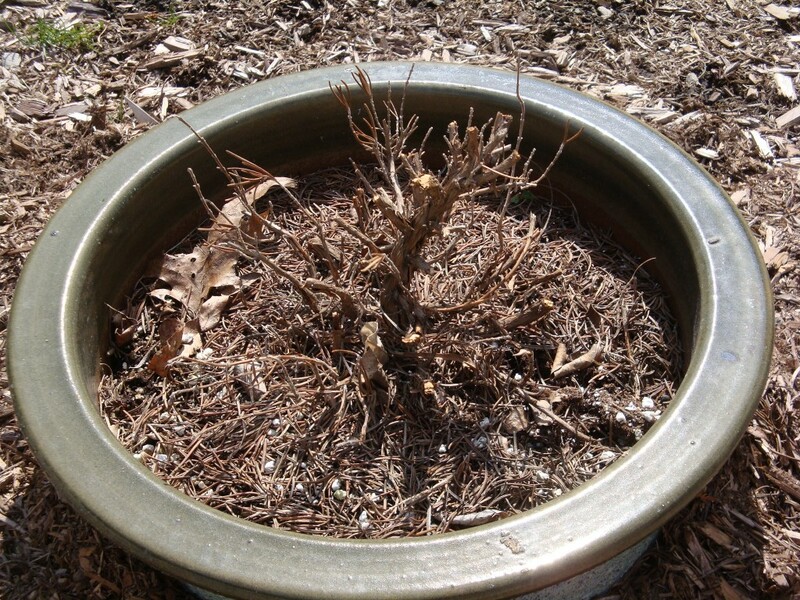 Rosemary…Rosemary..where for Art Thou? Be You Alive or Dead? The Oregano and Mint are pushing out new growth, but the Lavender and Rosemary are not looking so great…especially the Rosemary. Nary a needle was left on its branches. So I trimmed them all down and have my fingers crossed that it didn’t succumb to winter kill. The Thyme is also showing lots of new growth. It seemed to have fared better being put directly in the ground and covered with a heaping of mulch, I have made a mental note for next fall for all the herbs. As I dug under with the spade, overturning the hard-packed earth, startled earthworms wriggled to safety….one way to know if you have a fertile garden bed is by the abundance of earthworms. They are nature’s soil aerators and fertilizers, not just food for hungry Robins. 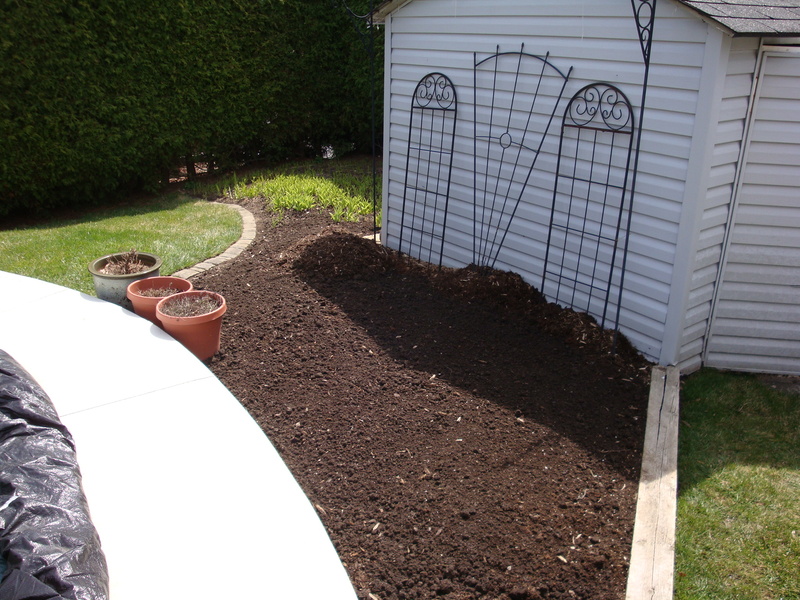 Once the bed had been turned over, I smoothed the soil out with a rake, making sure to get rid of a few early pesky weeds trying to take root. I then headed inside to grab some seed packets…carrots, beets, peas, radishes and bibb lettuce ~ today was the perfect day to sow them to take advantage of the cooler weather. Most root vegetables and lettuces prefer the cooler days/nights to germinate, unlike my beloved Pepper plants that need some sauna time before they decide to send a root or leaf forth into the world. There, all done. The bed now awaits the remainder of its charges, whom are basking in the sun’s rays in my living room window….but first I need some patience (ha!) to stifle the urge to get them into the ground now. Meanwhile, the Tiger Lilies are enjoying the space to themselves, content to hog the sunshine before their garden mates join them. You can fight City Hall, you can lobby your Government for change, but if there is one thing that will always be a losing battle, it is trying to fight Mother Nature. You would have more success bailing a boat with a thimble in a torrential downpour than beating the Grand Dame. This past weekend showed us her true powers. One day she blesses us with sunshine and warming rays, the next, she is raging with snow on 35 km winds. 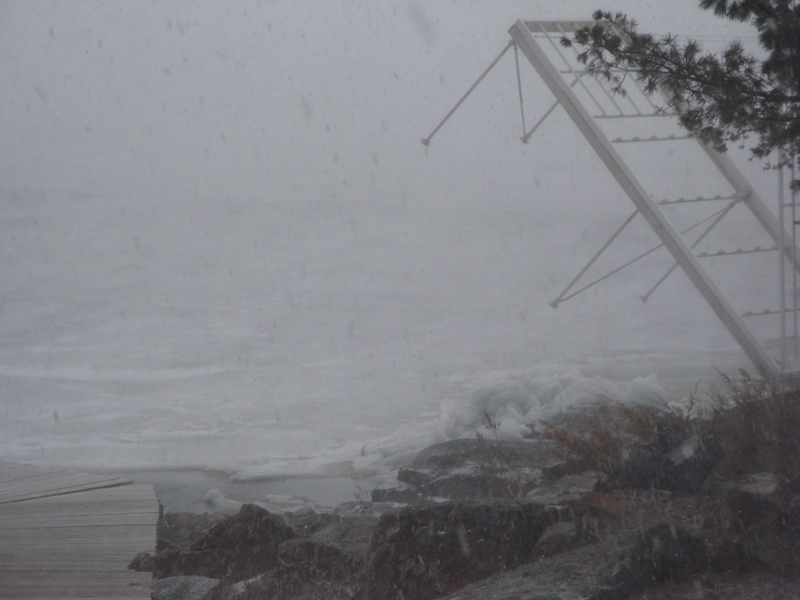 Friday night the wind howled all night long, we woke up to flurries being blown sideways from the west. Not a good wind direction as that is the direction our Homestead faced. 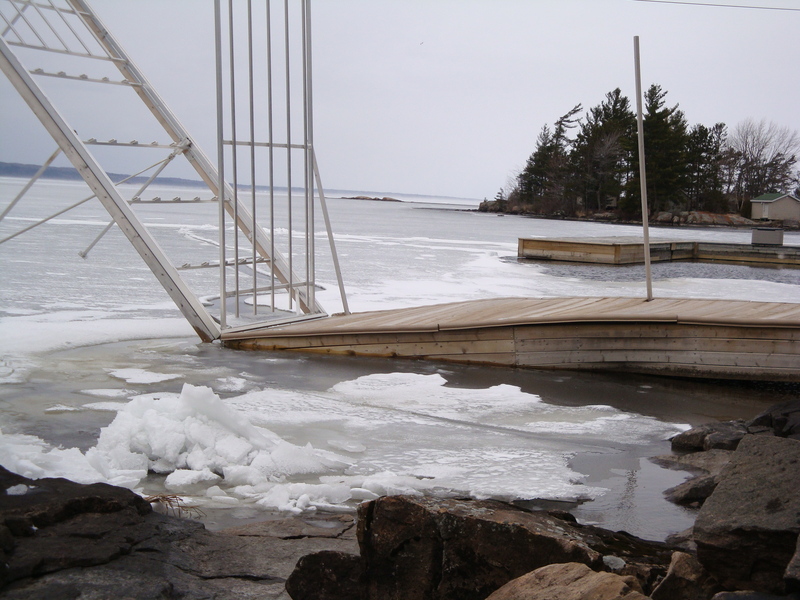 The lake ice had started to melt closer to shore and was breaking up due to 2 days of very heavy rain last week. Astonishingly, the lake level rose 21 inches in one week. From the time we arrived at the Homestead Friday afternoon, you could literally watch the lake level rise by the minute. Pretty much just the newly arrived ducks were happy after their long migration to have lots of open water to feed in. 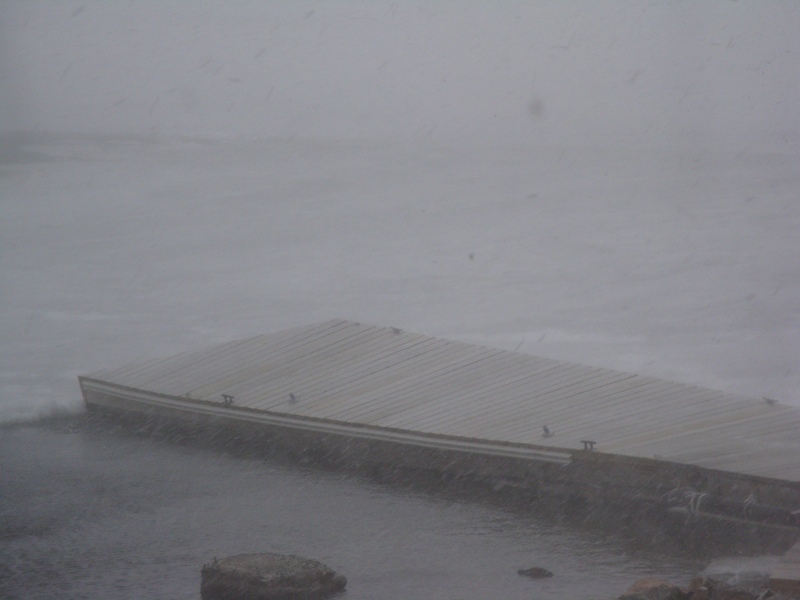 As I watched the blinding snow, I suddenly heard loud, banging noises, like the tail-gate of a dump truck slamming repeatedly….I looked over at the neighbours dock to see that the winds were blowing the ice in towards shore and his pipe dock began to buckle under the sheer force of the ice being shoved into it. The underwater pipe legs of the dock were snapping like toothpicks under the pressure… the entire deck lid was now arcing downwards, pointing nose first into the water. 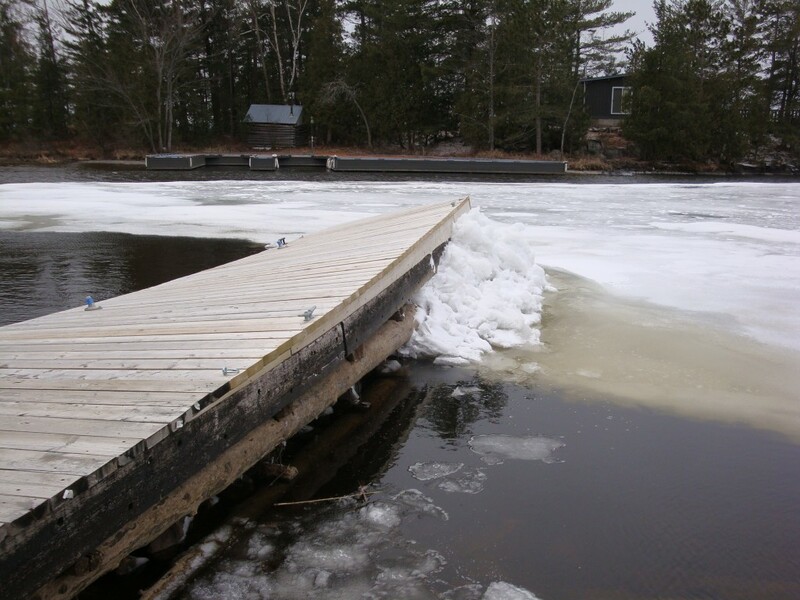 Hubby and I watched helplessly as the ice started piling up against our dock. Ours is a crib dock, with seemingly tons and tons of rock and small boulders weighting it down in place that has withstood what Mother Nature has thrown its way for better on 30 years….but not today, the newly rebuilt deck top was lifted off like the lid from a can of tuna and shoved over a foot and half to one side. In the span of less than a minute, the deck lid was sloping on at least a 30° angle, perfect if you want a summer slide into the water….not good for trying to dock a boat at though. Within half an hour, the winds subsided and by afternoon, the clouds disappeared, the sun was shining and what snow had landed was all but gone. The warmth of the sun blinding the memory of the fierce winds that tore through the area that morning, leaving upended docks around the lake as an ugly reminder of the powers that Mother Nature can conjure up when she desires. Psst…. come here…I have a FABULOUS New Workout Regime for you try out. Guaranteed to melt away any and all fat left on your body ~ If you live through it…. It is called ‘De-Thatching Your Lawn’…. and it is probably one of the hardest things to accomplish in your lawn care maintenance program. If you have one that is. Maybe you are the type that just ignores the grass and lets Mother Nature take it wherever she wants…like dandelion puffs blowing in the wind. Not us though, we have been known to be a tad overzealous in our lawn care here at our City Homestead…and speaking of dandelion puffs, soon, there will be front lawns everywhere sporting coats of bright, yellow petals, which will turn into aforementioned puffballs only to continue to menace the urban landscape. Dandelions are certainly one of Nature’s amazingly hardy and persistent producers. But back to de-thatching, which is the main topic here after all. 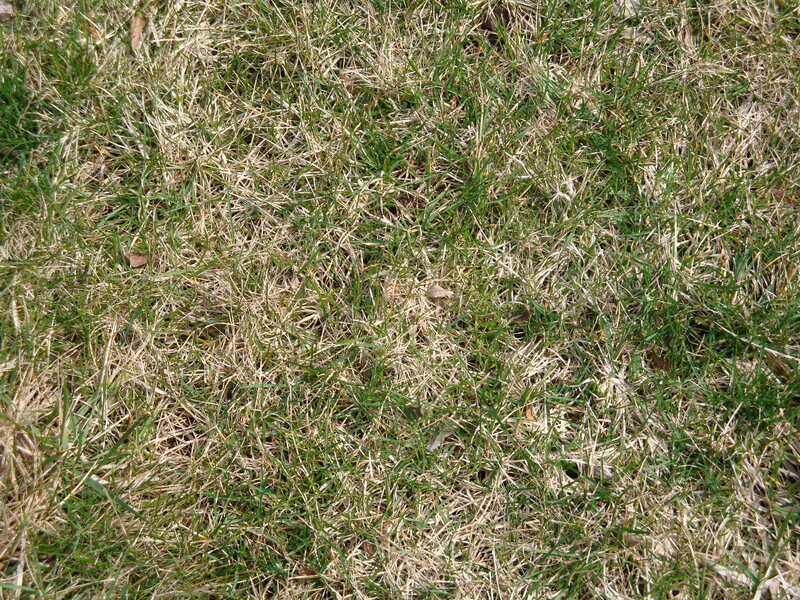 All summer, we mulch our grass clippings after mowing to keep the lawn from drying up too quickly in the heat, but come Spring, grass roots need a good aerating so that the weed n’ feed stuff can get down into the roots. 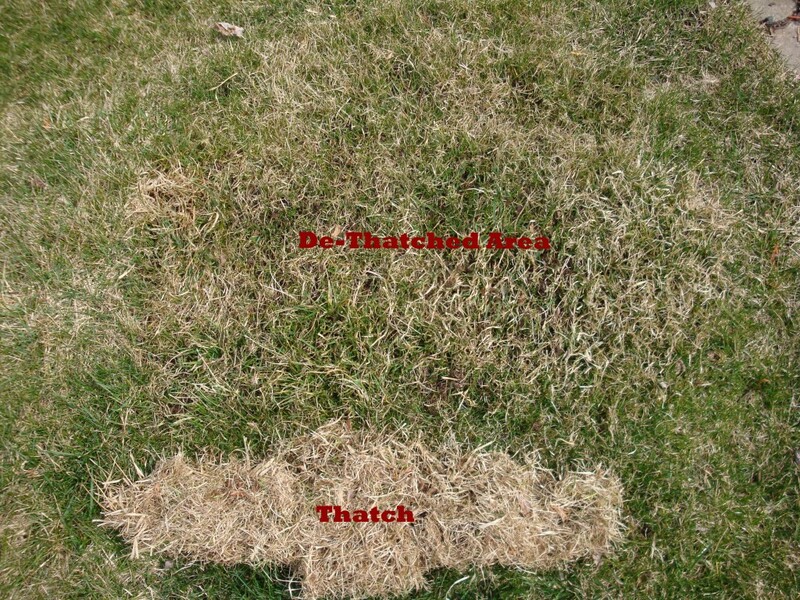 All those grass clippings from last year prevent that from happening, so…you need to de-thatch. First, you need one of these funky looking rakes, kind of looks like it could have been used as a medieval torture device…. You adjust the position of the rake to the handle so that one side is more vertical than the other, this allows you to really dig down deep to dislodge all the old grass clippings. 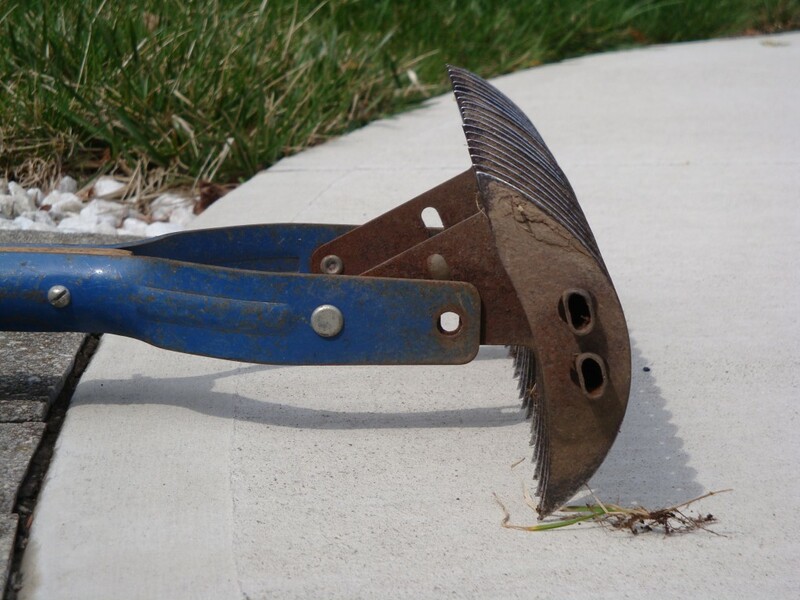 For areas that are newly sodded or seeded, turn it around so you have more of an angle for raking, thereby being careful not to dig up the newly laid sod. Once you have set one of these things in motion, it won’t be long until your upper back, neck and your arms are screaming ‘UNCLE!! !’ Forget tricep extensions at the gym, give one of these babies a try instead. Like horseback riding, you will discover muscles the next day you never knew you had. Oh…and it will take you forever to get your lawn done as it is tediously (tortuously?) slow going. We have been working on ours off and on for over a week, rain thankfully let us rest our weary muscles in between bouts. and here is the after shot…the grass is all fluffed up, like newly permed hair, and you can actually see the earth in and around the blades of grass. See all that thatch in a pile? That is just pulled from about 1 square foot…times many, many, many more hundreds of square feet to go…it is back-breaking work, and thankfully only done once a year. Then you can spread your weed n’ feed fertilizer and you are well on your way to having a nice, healthy, lush, green lawn…if you care too that is…. Is it really here? Spring? Maybe? Stop teasing us ok? Enough of the whacko weather, let’s get down to some serious sunshine and HEAT…. This week we had one day of clear blue skies and sun so I summoned the energy and courage to finish the dreaded de-thatching of the lawn. I found out something…we have a LOT of lawn space. If you do not know about de-thatching, you are lucky, more on that topic next week….suffice it to say de-thatching a lawn makes for a very exhausted and sore Homesteader. There are still many other outdoor Spring chores to do, but with the bulk of the hard stuff out of the way (and 8 full yard waste bags to put out to recycling), I can look forward to the fun stuff – like turning over the garden beds to get them ready for their summer residents. 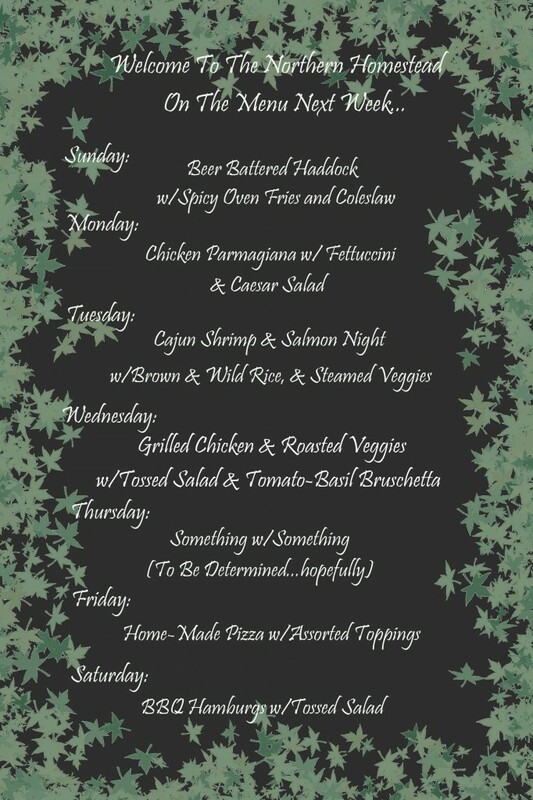 Next weeks menu lineup features a new recipe to try for beer battered fish. With never having made one before, let’s hope hubby has his game face on… I will report back on said recipe with a Pass, Fail or Never-To-Be-Attempted-Again. Lemons are useful in so many other ways. 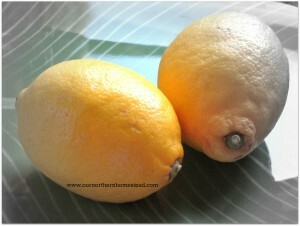 Not just for lemonade or lemon meringue pie, lemons are also one of nature’s best cleaning agents. Combined with Vinegar or Baking Soda, it makes an All-Purpose Cleaner without all the harsh VOC’s (Volatile Organic Compounds). These nasty chemicals are in all those mass produced cleaning agents, which can make the indoor air quality of your home more polluted than the outside air (and some are suspected carcinogens). Here at the Homestead, we are mindful of what we put down the drain as everything heads into our septic tank, and from there to the leaching field and ultimately, back into the earth. 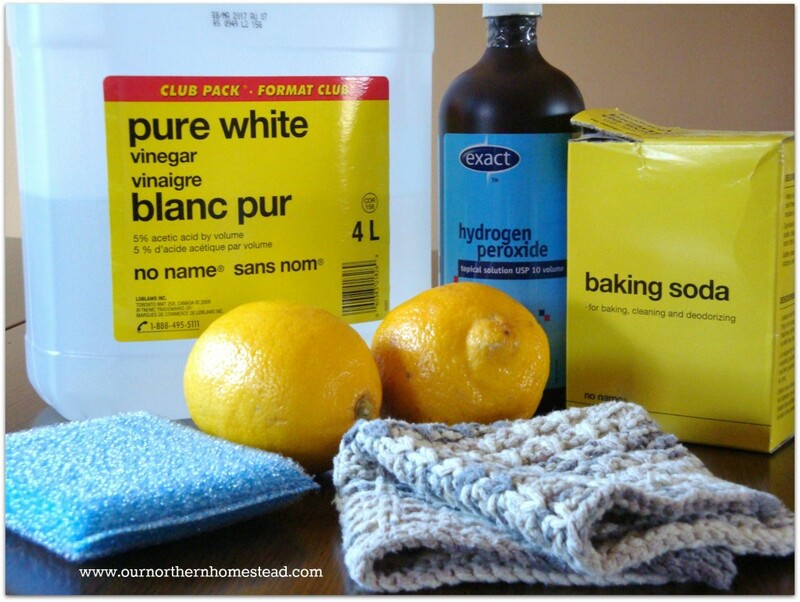 These 4 ingredients along with some elbow grease, are tough on stubborn stains throughout the home. Not to mention you will save oodles of money on toxic cleaning supplies as well as REDUCE the amount of garbage and recycling going out the front door. It is BAD, BAD, BAD! Combine into a spray bottle and use as a disinfectant spray on hard surfaces. *Do Not use Vinegar on marble or granite surfaces as it will eat away at the stone. Store in a spray bottle in the fridge and shake well before using. Olive oil replenishes and nourishes wood surfaces and makes them shine. Use to scour pots and pans, kitchen and bathroom sinks, bathtubs and it also makes a great stain pre-treat on greasy clothes. Store in a lidded jar. Want to ditch the Swiffer Solution and save money? Here is a wood floor cleaner that will do the same job for pennies a gallon. Mix the ingredients in a large bucket and mop away. This cleaner is for real wood floors, for laminate flooring, omit the Pine and/or Lemon Oil. Mix and store in a labelled jug, add 2 cups per load along with your clothes washing detergent. To get the grout in your bathroom clean (pre-treat mold spots with a Vinegar/Water solution of 2 tsp vinegar to one cup water and let stand for 30 minutes), then follow up with the grout cleaning solution below. Combine baking soda and hydrogen peroxide and mix to a paste, wipe on grout and let stand at least 30 minutes (longer if heavily soiled); then use a stiff-bristled brush to scrub stains. Do not use a wire brush as this will damage the grout. Rinse well and dry. By using the above cleaning solutions, you will be doing yourself, your family, your home, and Mother Nature a favour. I much prefer the smell of lemons than toxic chemicals in in my Homestead. Ever have a really strong, unexplainable craving? I mean, so strong a hankering that you will stop at nothing to satisfy it? That has been me lately with quinoa. The stuff has been on my mind for a couple weeks but I have not had the time to sit down to come up with something new and tasty…and good for the waistline, which has gotten out of hand since Easter. My yoga pants are becoming all too comfortable and I really begrudge getting out of my jammie bottoms to leave the house. A lemon, 2 remaining mushrooms, a couple green onions, about 1 1/2 cups of diced, multi-coloured bell peppers that I had squirreled away in the freezer, and some garlic on it’s last legs. I opened the pantry looking for the Quinoa and remembered that I had both white and red Quinoa on hand…hmmmm….why not use half of each? A great way to add some more colour to the dish and perk it up. Please note ~ before you cook Quinoa, remember to rinse it well under cold running water to get rid of the saponin, it is a bitter tasting coating on Quinoa that renders it unpalatable. The plants produce the saponin to deter insects and birds from eating the Quinoa. Cook 1/2 Cup Quinoa according to package instructions. 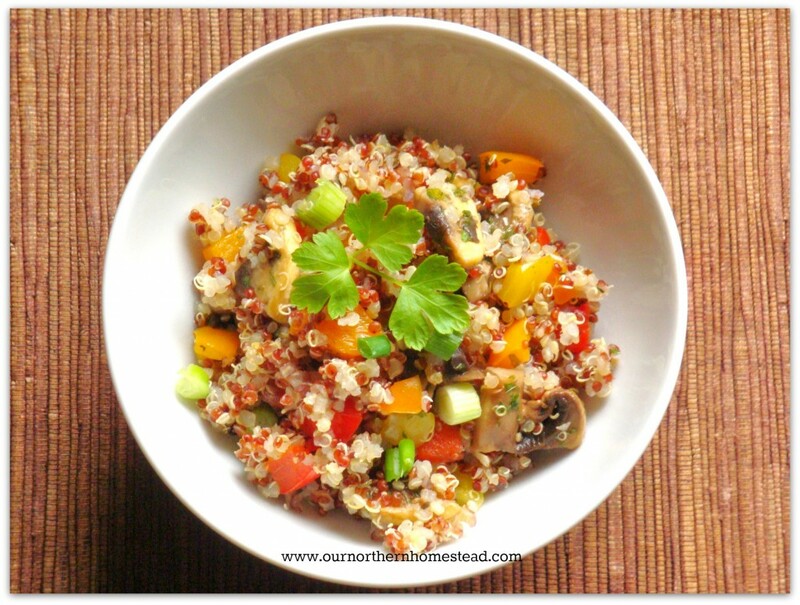 While the Quinoa is cooking, saute the peppers and garlic in a tsp of Olive oil, then added the sliced mushrooms, sea salt, fresh ground black pepper and the dried herbs; cook over medium-low heat until the mushrooms are cooked through. 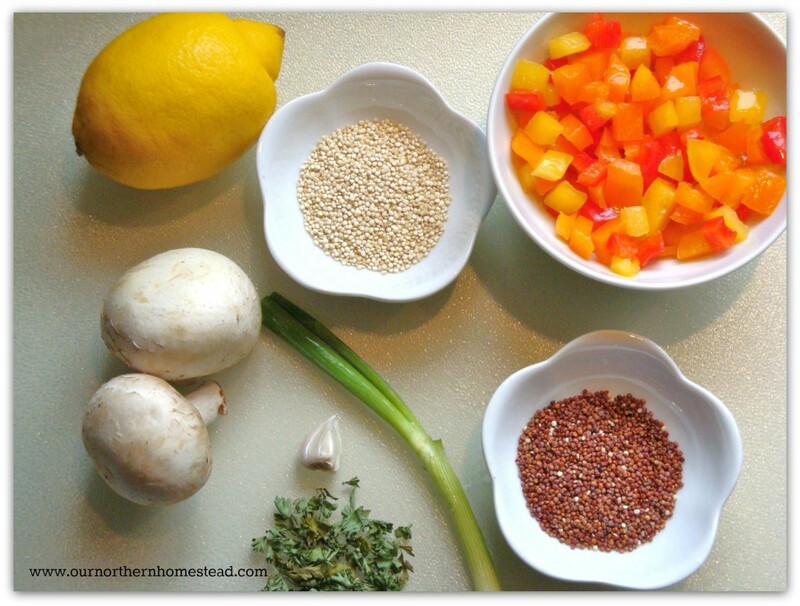 Remove from heat, add the cooked Quinoa, the fresh squeezed lemon juice, green onions and fresh parsley if using. Adjust seasonings to taste at this point. Serve hot or cold. Makes 4 servings. FYI – This salad makes an excellent filling for wraps for lunch on the go.